Sustainable development requires that overriding priority be given to meeting basic human needs, especially those of the poor, and recognition of the limitations associated with technology and social organizations that impact the capacity of the environment to meet both present and future needs. Sustainable development requires the integration of economic and ecological considerations in decision-making. Governments must make key national, economic, and sector-specific agencies directly responsible for ensuring that their policies and activities support development that is economically and ecologically sustainable. No single blueprint exists for sustainable development, because conditions vary among countries. Each country will have to create its own approach to reflect its needs. No quick-fix solutions exist. The journey towards sustainable development is often as important as the end product. The outcome will not always leave everyone better off. There will be winners and losers, always making achievement of sustainable development difficult. Regarding water management, sustainable development has generated attention on four principles. First, fresh water should be regarded as a finite and vulnerable resource. Effective management links both land and water across the whole of a catchment or groundwater aquifer, and therefore effective management requires a holistic approach in which social and economic development is linked to protection of natural ecosystems. Second, water development and management should be based on a participatory approach, involving users, planners, and policymakers at all levels. This also means that decisions should be taken at the lowest (most basic) appropriate level via open public consultation with, and involvement of, users. The concept of sustainable development applies not only to water itself, but also to the living resources it supports. 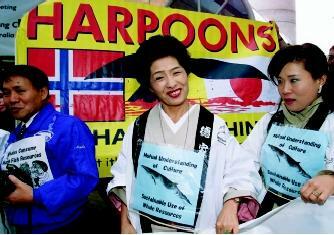 Shown here are Japanese supporters of commercial whaling standing in front of an anti-whaling banner at an annual meeting of the International Whaling Commission. Third, because women play a central role globally in the provision, management, and safeguarding of water, they should have more opportunity to participate in planning and managing of water resources. Fourth, water has significant economic value, and thus should be recognized as an economic good. However, it also is essential to recognize the basic right of all humans to have access to safe, drinkable water and sanitation. Pricing water as an economic good will discourage wasteful and environmentally damaging uses of water by encouraging conservation and protection of water. Yet current policies and practices often do not reflect these four principles of sustainable water management. The basic human needs for drinking water and sanitation are not met for many people in various countries. During the 1990s, one billion people lacked an assured supply of good quality water, and 1.7 billion people had no adequate sanitation. Water-related diseases caused about 8 percent of all illnesses in developing countries, affecting two billion people each year. Moreover, most countries do not treat water as an economic good. And in many countries, water management is fragmented among many sectors and institutions, making it difficult to manage water holistically. Fragmentation also makes it difficult to integrate environmental, economic, and social considerations, or to link water quality to health, the environment, and economic development. Management often over-relies on centralized administration, with few opportunities for local people to participate in planning, management, and implementation. The concept of sustainable development receives mixed reviews from developing countries or from countries in distress, where residents may struggle to meet basic survival needs. 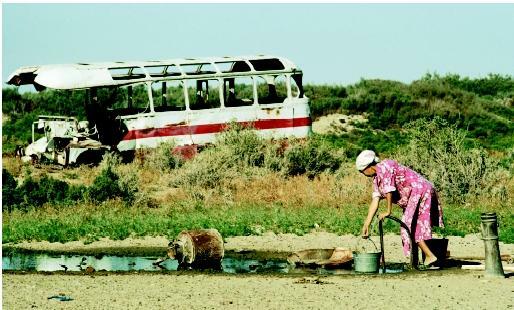 For example, the daily challenge of finding drinkable water (shown here in the Aral Sea region of Uzbekistan) now outweighs visionary concerns such as the need for long-term environmental protection. Ironically, nonsustainable development of the Aral Sea since the 1960s was responsible for the negative economic, environmental, and public health impacts in subsequent decades, and to the present day. and regional "visions" related to water use, development, and management, as a first step toward ensuring water is managed systematically in the twentyfirst century. Given the above observations from the World Commission, it is not surprising that many different interpretations have emerged for sustainable development. In developed countries, the main interest has focused upon integrating environmental and economic considerations into decisions about development. Particular emphasis has been given to intergenerational equity , or how to ensure that decisions taken today do not have unreasonably negative effects on future generations. For developed countries, there has been concern that in striving to avoid environmental degradation, decisions do not jeopardize economic competitiveness at a global scale. The perspective of developing countries has been different, with priority usually being on how to meet basic needs of present citizens. Thus, the focus has been on intragenerational equity (i.e., fair treatment for the present generation), in the belief that people whose basic needs are not met will not worry about long-term environmental degradation. Furthermore, to ensure meeting basic needs, developing countries often give priority to achieving economic development. These countries are resentful when developed countries argue they should forego the economic benefits, for example, from cutting down rainforests or damming rivers for hydroelectricity. At the 1992 Earth Summit in Rio de Janeiro, these different interpretations led to major disagreements between representatives of developed and developing countries. In the debate over water management approaches, some view sustainable development as a vague and ambiguous concept, leading people to define it to suit their own interests—either economic development or environmental protection. Some suggest that its emphasis on achieving balance between economic development and environmental protection overlooks the importance of ensuring sensitivity to the social and cultural attributes of societies. Others argue that sustainable development imposes the values of Western capitalist systems, and therefore reject it on ideological grounds. Yet supporters of sustainable development argue that ambiguity provides desirable flexibility to customize strategies to reflect the needs and conditions of different countries and societies. Furthermore, its attention to the importance of protecting the environment is viewed as an essential counterbalance to a pattern of decision-making that often gives overriding precedence to economic benefits, regardless of environmental and social costs. As the World Commission on Environment and Development observed, sustainable development is not a magic formula to guarantee economic prosperity, ecological integrity, and cultural sensitivity. However, it has become a powerful concept, triggering much debate and discussion about the implications of development decisions, related to water and other resources, and has led to much more attention about what is an appropriate balance among economic and environmental considerations. SEE ALSO Economic Development ; Environmental Movement, Role of Water in the ; Integrated Water Resources Management ; War and Water. Gleick, Peter H. "The Changing Water Paradigm: A Look at Twenty-first CenturyWater Resources Development." Water International. 25 (2000):127–138. Keating, Michael. The Earth Summit's Agenda for Change: A Plain Language Version of Agenda 21 and the Other Rio Agreements. Geneva, Switzerland: The Centre for Our Common Future, 1993. Loucks, David P., and John S. Gladwell, eds. "Sustainability Criteria for Water Resource Systems." IHP International Hydrology Series Cambridge, U.K.: Cambridge University Press. Serageldin, Ismail. Toward Sustainable Management of Water Resources. Washington, D.C.: The World Bank, 1995. World Commission on Environment and Development. Our Common Future. NewYork: Oxford University Press, 1987. Young, Gordon J., James C. I. Dooge, and John C. Rodda, eds. Global Water Resources Issues. Cambridge, U.K.: Cambridge University Press, 1994. In 2002, the city of Johannesburg, South Africa hosted a 10-year follow-up to the 1992 Earth Summit held in Rio de Janeiro, Brazil. The purpose of this international meeting was to bring together major groups, governments, and the United Nations to take action for sustainable development and to review progress since the 1992 Earth Summit. Known as the World Summit on Sustainable Development, the 2002 Summit focused on five key areas: water and sanitation, energy, health, agriculture, and biodiversity. At the meeting, negotiators for 191 countries agreed to the 71-page Summit Plan of Action, intended to set the world's environmental agenda for the next 10 years. The 2002 action plan included goals for reducing by half the proportion of people without access to proper sanitation by 2015, and similarly reducing by half the proportion of people without access to clean drinking water. More information about this Summit is available at <http://www.waterdome.net> . full-cost pricing, after ensuring that basic human needs are satisfied.